Participants: app. 80, not counting "significant others"
This was now the fourth European Triode Festival, the first three took place in Denmark, near Arhus, in 2000 to 2002. Those festivals are organized around the so called "Joelist" (mailing list of Sound Practice tube/valve DIY magazine), and are heavily influenced by the spirit of using triodes in DIY hi-end amplifiers. All the folks bring their own DIY amplifiers, CD players, turntables, high efficiency loudspeakers with them and in a club like atmosphere talk about the latest tweaks that bring them to heaven. The ETF.03 was not a conventional public show with daytime visitors (as this would have disturbed the informal atmosphere) -- the participants had to stay all three days of the festival (which this year was organized by Wolfgang Braun and Christian Rintelen). This year the festival was organized a bit more than the years before, there have been several lectures and shootouts a day. The ETF.03's guest of honor, Steve Bench (his site, USA) talked comprehensively about his X-amp, a power amp amplifying sum and differential of a signal stereo signal independantly, then at the output making the correct matrix to give two channels again. Guido Tent (his site, NL), Peter Millet (his site, USA) and Manfred Huber (his site, D) elaborated on the various methods of providing filament power. In the following shootout DC voltage feed was rated last, and the other methods (AC voltage, high-frequency (100kHz) voltage and DC current) all had their special merits. AC voltage was considered good to mask other components' faults, while playing musically satisfying nethertheless. High frequency voltage and DC current feed were considered most neutral and clear, with HFV being slightly better in the bass and DCC slightly better in the treble. Small changes in the test bed setup showed that results depend very much from setup. Allen Wright (Vacuum State Electronics, AUS) presented for comparison the same recording on master tape (third generation copy, played on Revox G36), on LP (played on EMT938/FR64S/SPU), on CD, on SACD (played on a Wright modified Sony 200 EUR player). This showed clearly how limited CD playback is. Later Kurt Steffensen (his website, DK) jumped in with his modded Pioneer DV-656. There have been some more modded or complete DIY CD players, and the shootout showed that only some of them could compete with vinyl replay. Wolfgang Braun (D) organized the comparison of full-range speakers. He had a big open baffle with him and everybody could bring his fullrange speaker to be auditioned. 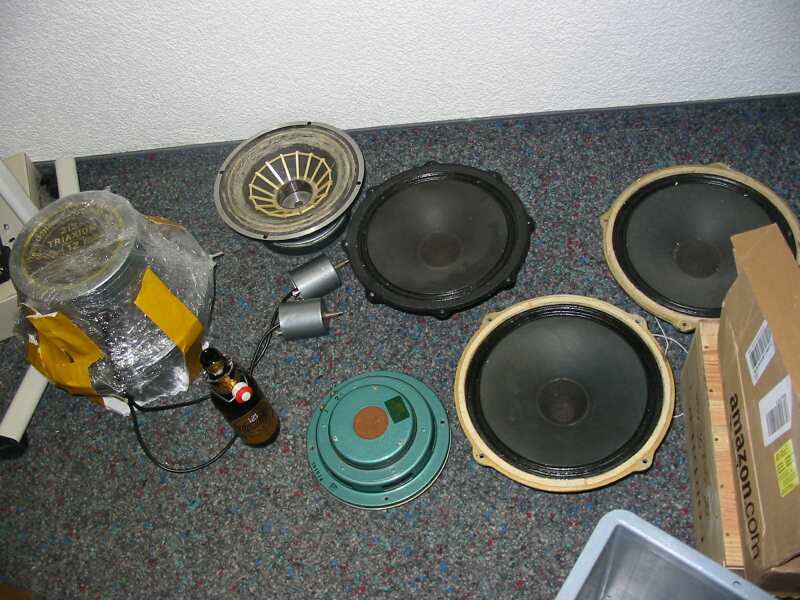 This part was the most exciting of the festival, comparing 16 famous fullrange speakers, including PHY-HP 21, Altec 755E, four variations of East German KSP215, two modified Supravox (one Ferrit, one enormous Alnico, both had their whizzer cones removed and cones lacquared - but not with C37), the Holger Stein fullrange (his website, D), Diatone P-610, Fostex FE168 Sigma, Goodmans Axiom 80, and some others (I forgot). For an overview on fullrange drivers see http://melhuish.org/audio/drivers.html. Sadly, no Saba green cone or Manger bending wave transducer had been present. A multi-level shootout was necessary, and the drivers were grouped in quads and later in pairs. Musical pieces for comparing are mostly fun music, like "Fever". Winners have been the Altec drivers and the modified Supravoxes, though some others have been considered excellent, too, which had been discarded earlier when partnered with another driver highlighting its weaknesses. The Diatone I considered most neutral and clean, but less dynamic, OK it is only a 16cm, while most of the others are 20cm (8inch) or even 25cm (10inch). The PHY-HP was powerful and very clean, too, but lacked treble extension. Wolfgang Braun did an excellent job with his open baffle construction. I never heard the PHY-HP as good as in this baffle. The Goodmans had excellent mid to treble clarity but were a bit lightweight in the bass. They changed hands for a lot of money immediately after the shootout. The Holger Stein fullrange was very powerful and really let it rock. Most dynamic was the Alnico Supravox. One of the East German KSP215 variants was very good (that with double cone, but without plastic in the dustcap). The reason the Altec won was that after four hours of listening nobody wanted high resolution, but only fun, as it lacked seriously in treble and mid clarity. In the end nearly all drivers (except the Fostex and some other double cone drivers) were considered good, and at the same time none of them perfect. This makes the choice not easy ... The auditorium was quite big (app. 70qm or 700sq.ft.) so the little drivers had to work a lot. 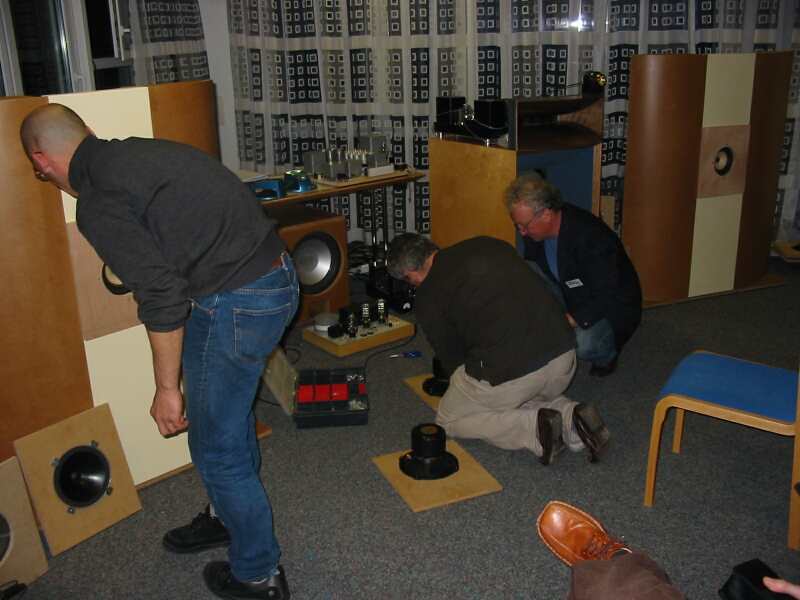 The other day, Christian Rintelen's (his website, CH) "Blue Thunder" two way horn system showed to everyone howe real dynamics sound in that room. Pieter Treurniet (Tribute Transformers, NL) demonstrated the theoretical and practical effects of exotic transformer core materials, like amorphous and nickel cores. Manfred Huber (D) did the corresponding shootout with a testbed power amp. The differences could clearly be heard between RE-core and C-core, and to C-Core amorphous. Though the audiance did a rather mixed rating of their sonic qualities. Thomas Mayer (D) auditioned a range of his phono stages, which all employ the very liberal use of chokes and transformers. He even did a phono stage with directly heated triodes only. In the following shootout, his symmetrical EC8020 phono stage was rated quite high. Though the other phonostages, like from Manfred Huber (D), Allen Wright (Vacuum State Electronics, AUS) showed to have a lot of qualities, too. On Saturday evening, a live music band, with a good horn section, played rythm and rock for disco. 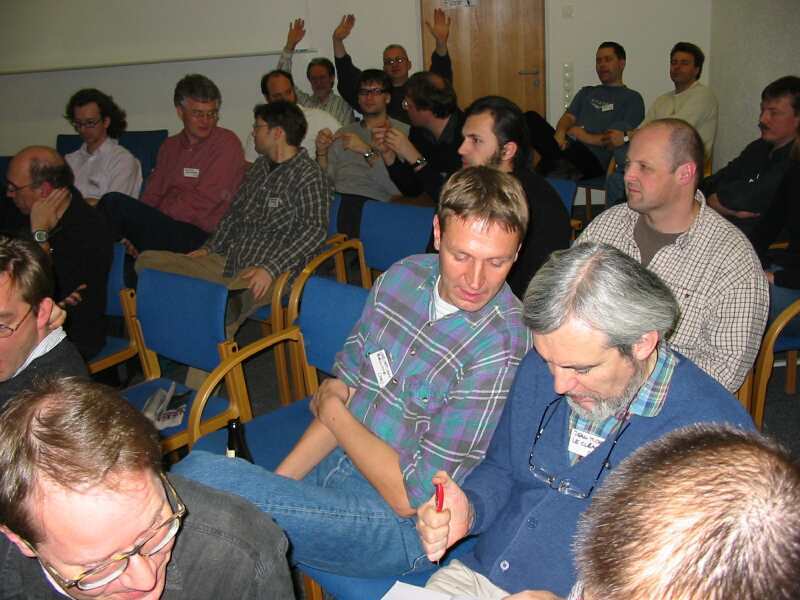 Next European Triode festival will be held on Dec 2nd to 5th, 2004, same place.